March 2019: Watching IllumiNations for the last time! Disney Parks announced this week that IllumiNations: Reflections of Earth will have its final show on September 30, 2019. It premiered on October 1, 1999. The new fireworks show called Epcot Forever will debut at 9pm on October 1, 2019. Kites flying high during new the Epcot Forever fireworks show preview this week. This is a temporary fireworks show until the new IllumiNations replacement show premieres in early 2020. The official replacement for IllumiNations, yet unnamed, will debut in 2020 and will feature massive floating set pieces, custom-built LED panels, choreographed fountains, lights, pyrotechnics, and lasers. The yet-unnamed show will celebrate how Disney music inspires people around the world. All the World Showcase pavilions illuminated during the IllumiNations fireworks. Red, white, and blue fireworks set to wonderful music. CP Moment #18: Watching IllumiNations for the first time with your DCP roommates. 9pm at Epcot. We’ll miss this fireworks show! We’ve grown up with it. We’ve written two books about our time working at Disney World. 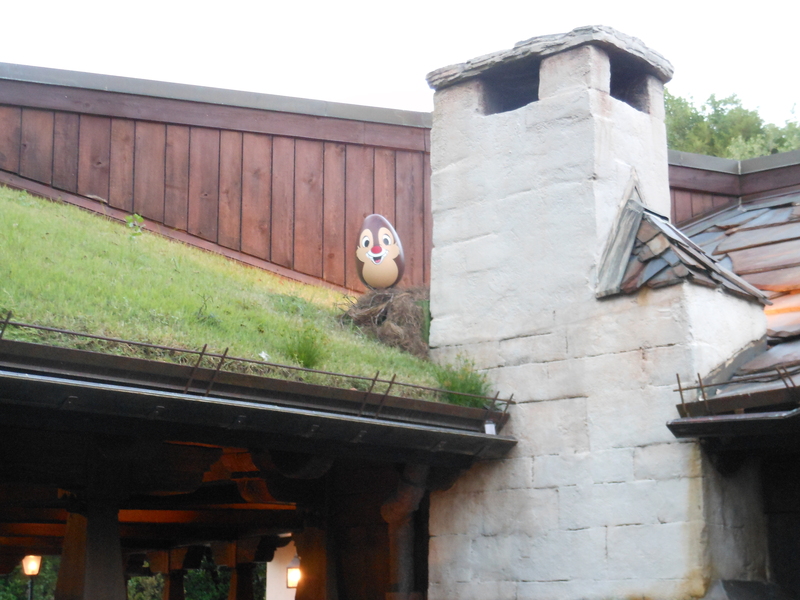 Look for the giant Easter Eggs at Epcot all over the World Showcase. 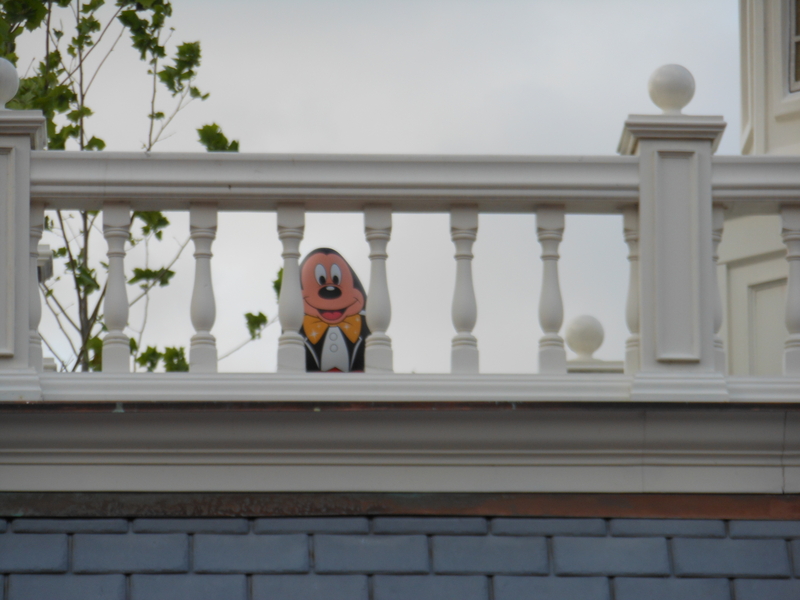 From April 5 – April 21, 2019, guests at Epcot can search for special hidden “eggs” themed to Disney characters and record their discoveries by placing the corresponding sticker on the specially themed “Egg-stravaganza” map. Maps and stickers can be purchased for $6.99 at the entrance to World Showcase. 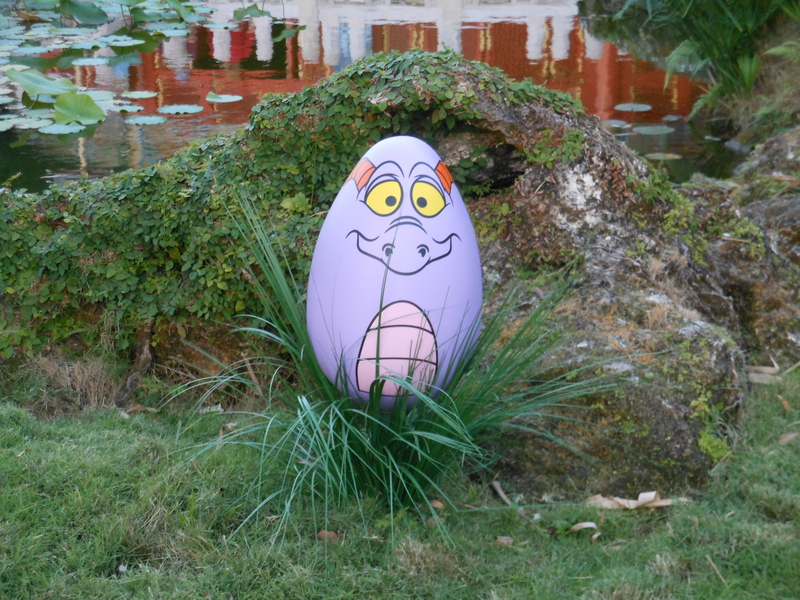 Epcot’s Egg Hunt map and stickers for 2019, $6.99, and you get a free prize. The 2019 Easter Egg prize eggs. There’s also a springtime scavenger hunt going on at Epcot called Spike’s Pollen Nation Exploration. 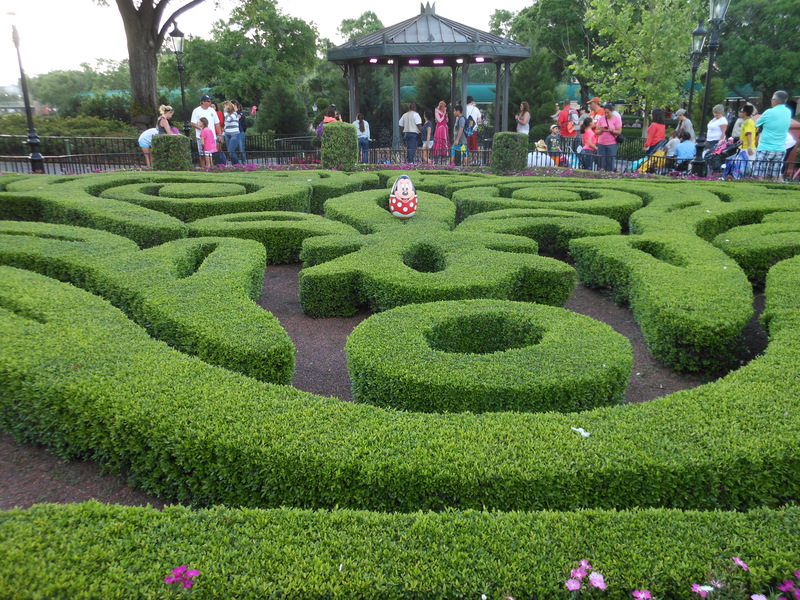 In this hunt, Disney’s favorite honey bee, Spike, has been pollinating his way around the flower and garden festival, giving gardeners of any age the chance to follow his pollination trail around World Showcase at Epcot. It’s easy to start this new scavenger hunt. Just pick up a garden map and stickers at Port of Entry, $6.99. Then, it’s time to look for Spike! Spike’s Pollen Nation Exploration will run for the duration of the 2019 International Flower and Garden Festival , March 6 – June 3, 2019. Both Festival maps are $6.99 each. 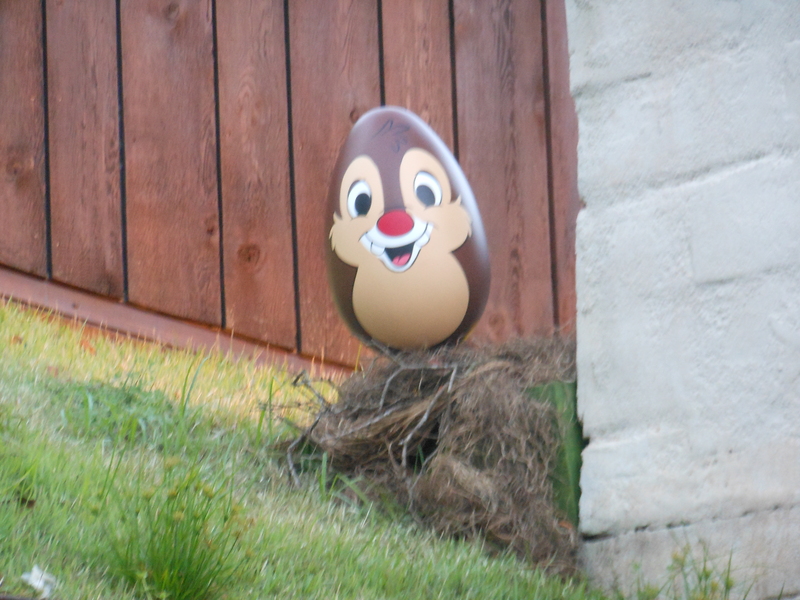 And, Epcot isn’t the only Disney Park that’s holding an Giant Easter Egg Hunt this year. 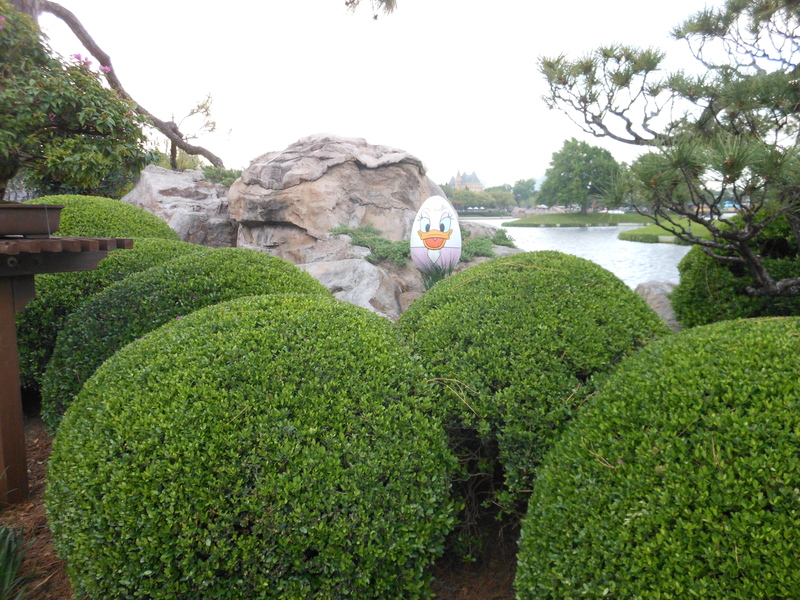 You’ll need to buy 3 maps ($6.99 each) to complete Disneyland’s egg hunt!!! 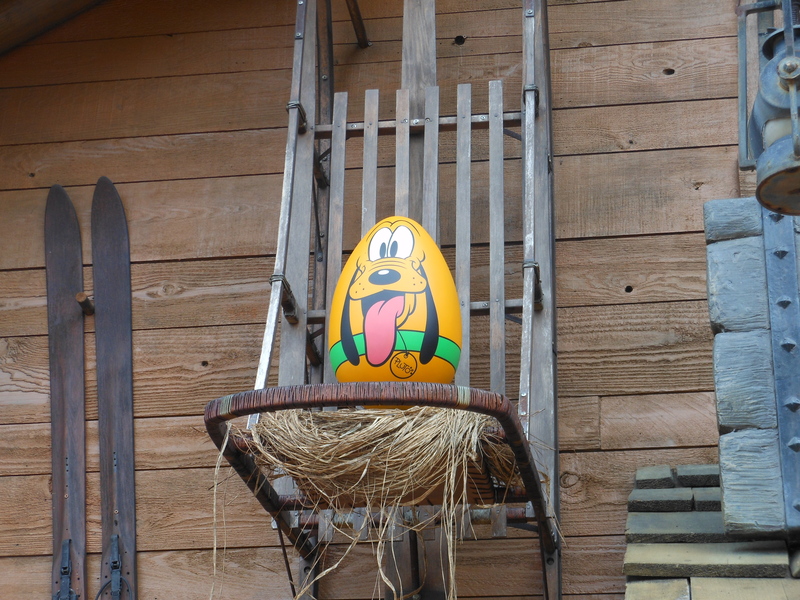 The Easter egg scavenger hunt at Disneyland will take place from April 5 – 21, 2019, at Disneyland park, Disney California Adventure park, and Downtown Disney District. Disneyland Park – Disneyana, Disney Showcase, “it’s a small world” Toy Shop, Little Green Men Store Command, Pieces of Eight, Pioneer Mercantile and Stromboli’s. Easter Egg cake pops at Disneyland! Yummy! Whether you choose to hunt for eggs or not, return your map to a redemption location for a special surprise – a mini Easter egg to remember your hunt by. You get to keep your map, they just mark it with a star! 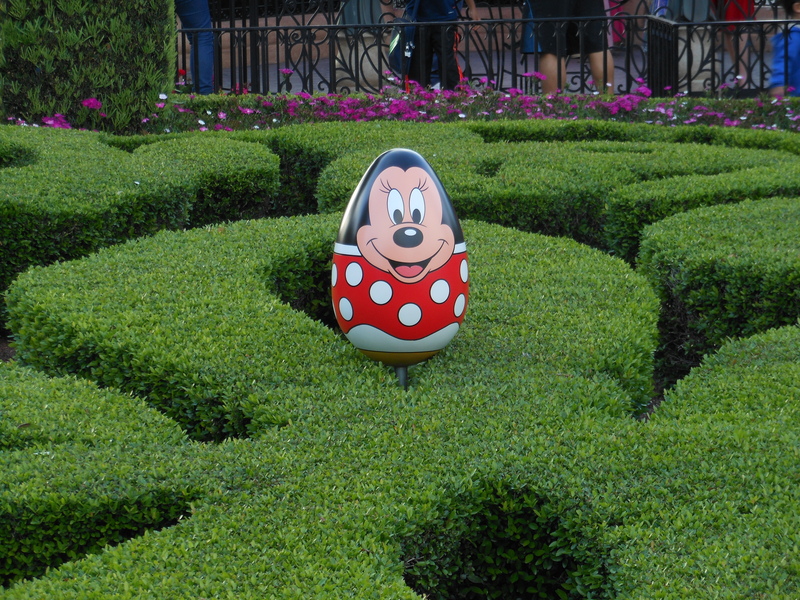 Disneyland’s Easter Egg Hunt starts April 5th. So much fun! April 2019: New Spring cupcakes from the Main Street Bakery for Easter!! YUM! 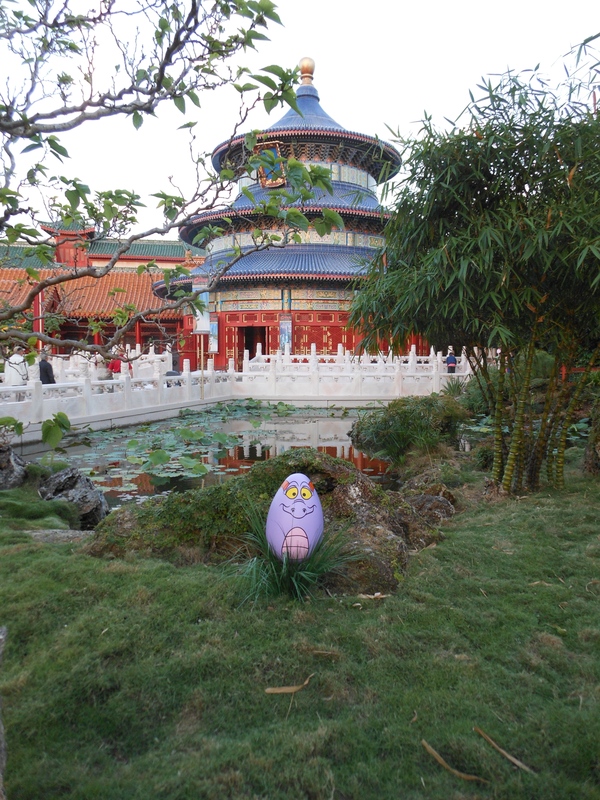 We love doing the Giant Easter Egg Hunt at Epcot! 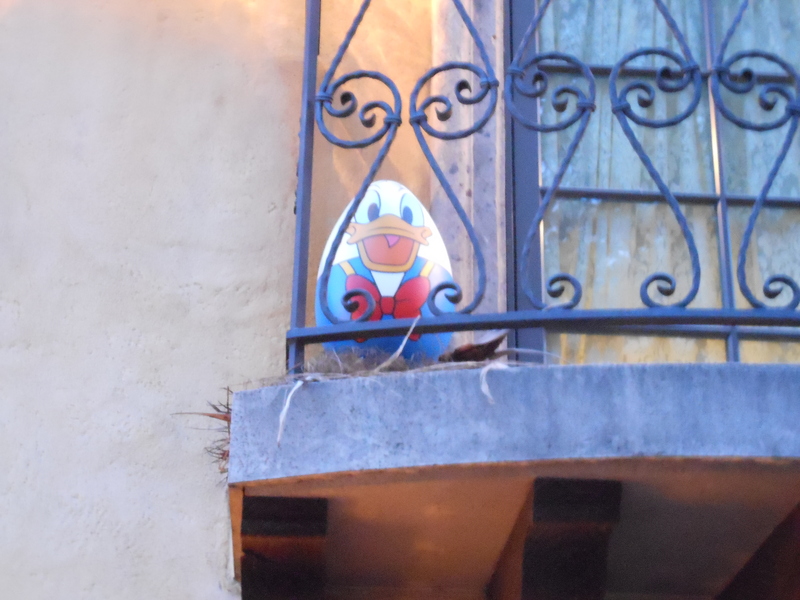 Finding an Easter Egg by China. Now it looks so obvious!!! 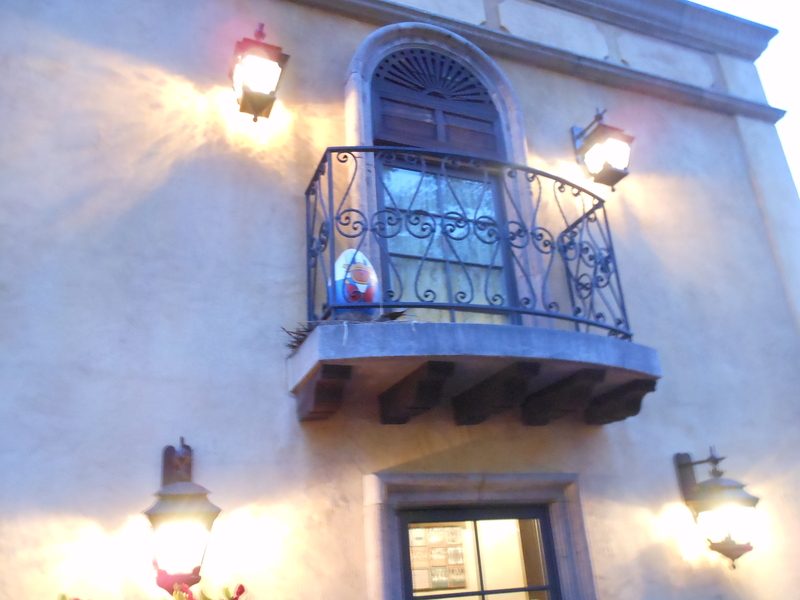 The cast members we asked followed us outside and laughed when we finally found it! Triumphant Elly! 1st egg found!! Sometimes, they’re a little hard to spot. These Easter egg pins are so cute! 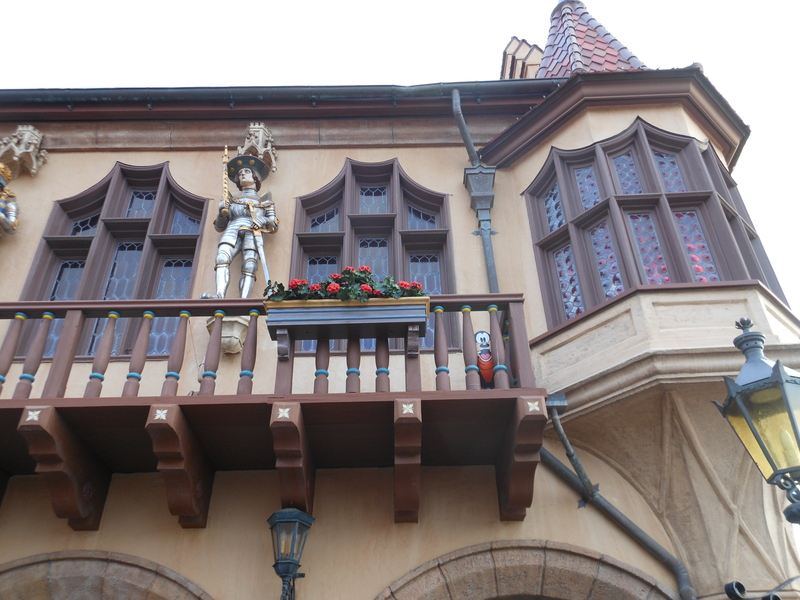 Belle and the Beast at Epcot France Pavilion. The extended 2019 International Flower and Garden Festival runs March 6 – June 3, 2019 this year. Caroline and Christian at the 2019 International Flower and Garden Festival. Don’t forget to pick up an Orange Bird Sipper! We each got one! 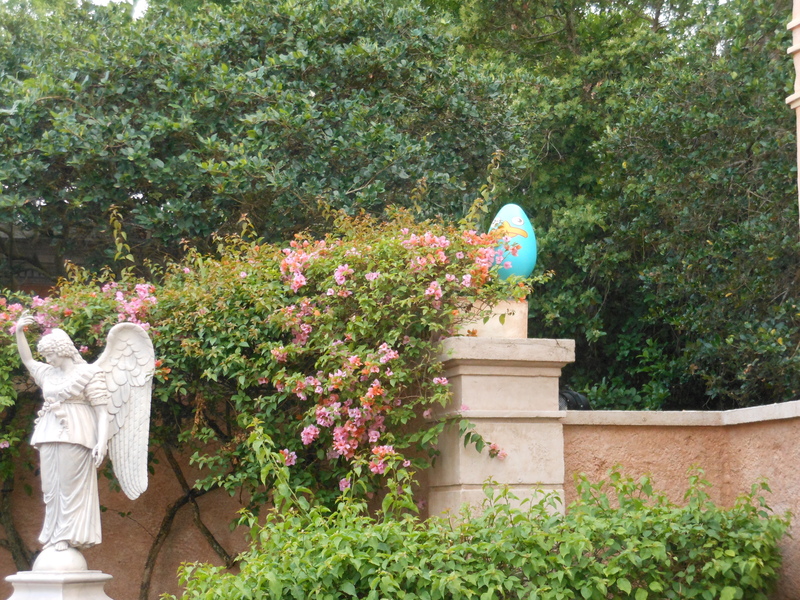 Meeting Mr. and Mrs. Easter Bunny at DAK. 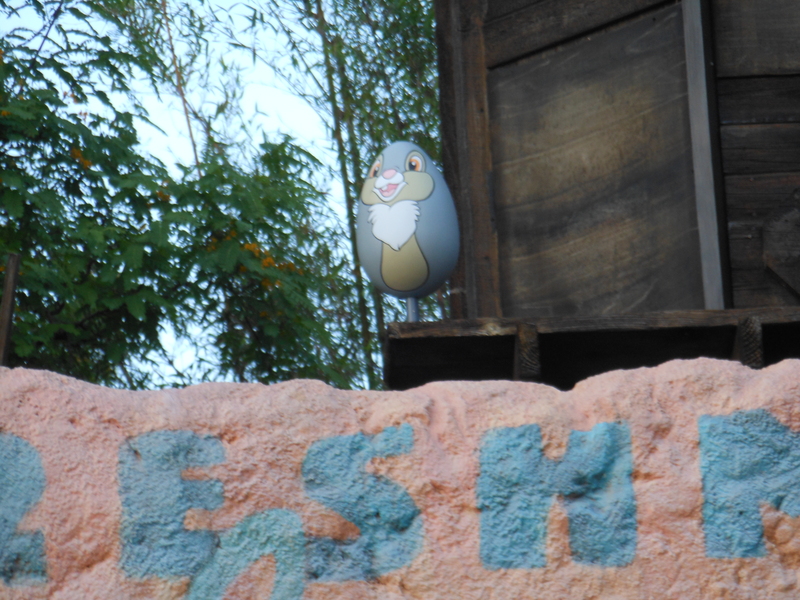 Note: Easter Sunday is April 21, 2019 and special characters will be out and about at several of the Parks for meet and greets, including Mr. and Mrs. Easter Bunny!!!!! 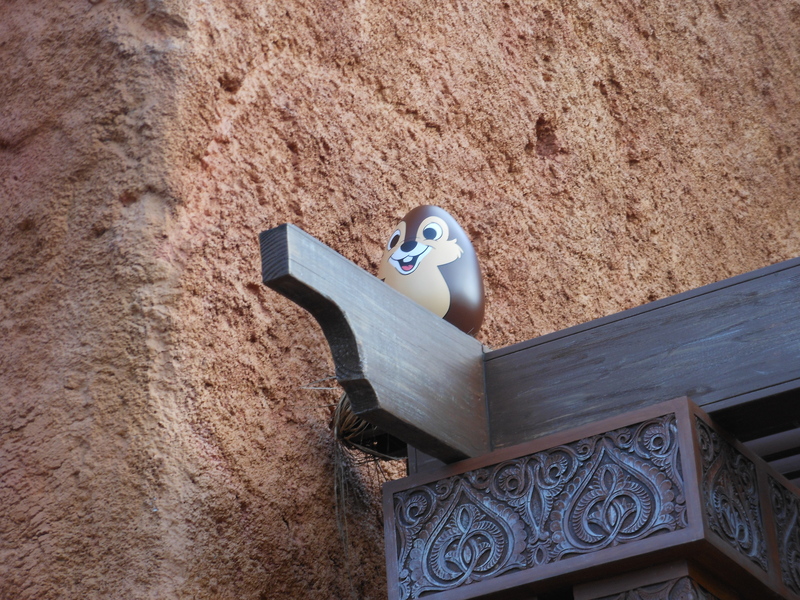 April 2018: Look who was out at DAK! 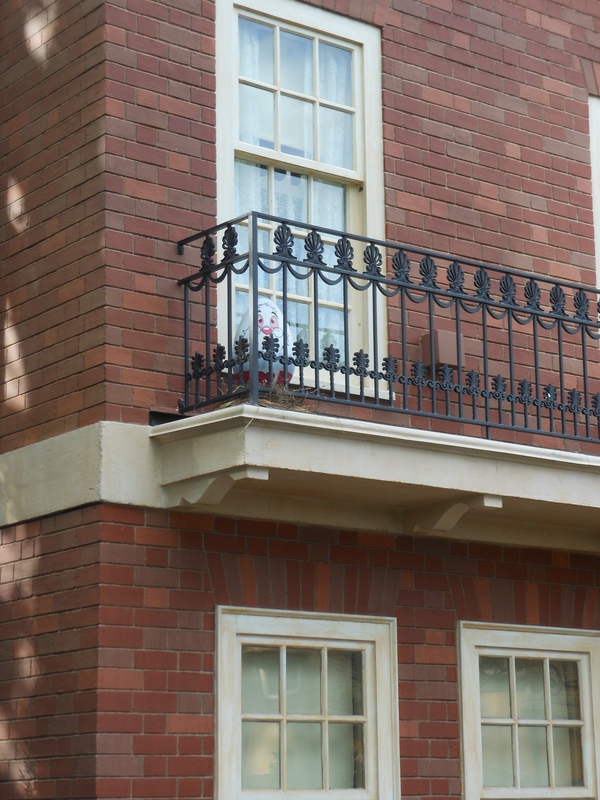 Mr. and Mrs. Easter Bunny are greeting guests at the Magic Kingdom all month. 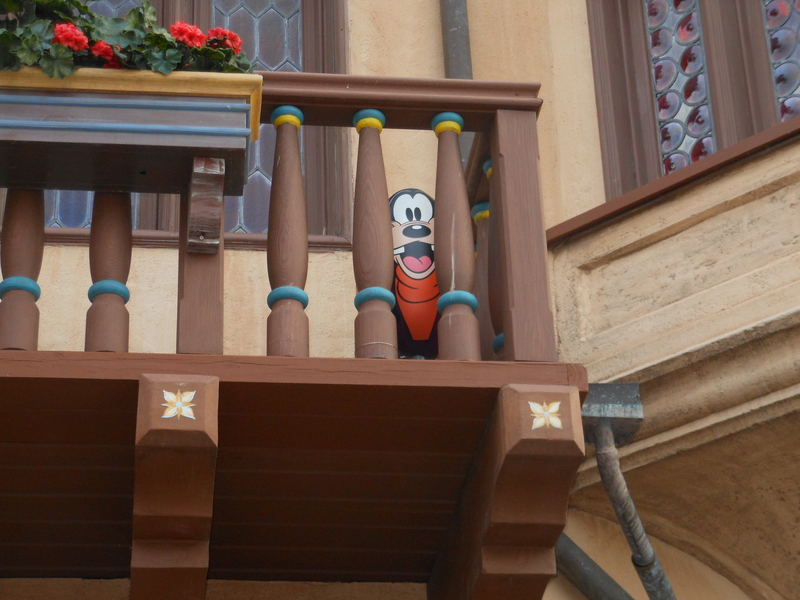 The Orange Bird Sipper is Back at Epcot! Caroline buying an Orange Bird Sipper at Epcot last weekend. After selling out the entire Orange Bird Sipper inventory for the 2019 International Flower and Garden Festival the very first week, a new shipment of Sippers arrived last Saturday. Yeah! We each got one…So cute! This little guy is soooo cute! Limit 10 sippers per guest (that will cost you $140!). The wait line at The Citrus Blossom booth to get one of these sippers filled with Orange Slush has consistently been about an hour. Guests were lining up at the Citrus Blossom booth before it opened! One hour wait line to buy an Orange Bird Sipper! 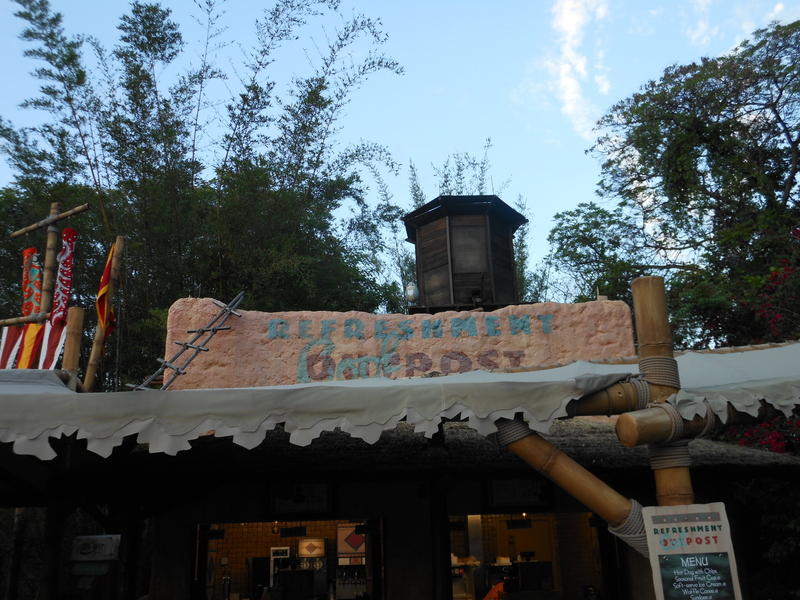 There’s citrus-flavored food available at The Citrus Blossom booth too…including Lobster Tail!!! No time? They’re available on ebay for between $30-$60 a sipper! April 2, 2019: Orange Bird Sippers available on ebay. 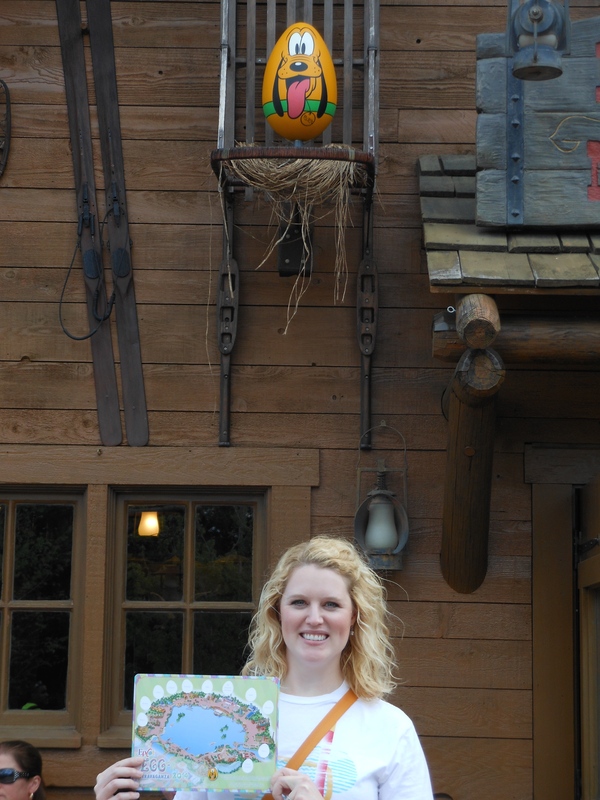 Disney initially only ordered 45,000 Orange Bird sippers for the 90 day Festival that runs into June this year. That’s 500/day. Right now, they’re selling 3x that many a day. They put in a huge reorder March 12th after selling out. Insider Tip: They might totally run out before the Festival ends on June 3, 2019. Get one quick if you want one! Both are available on Amazon.com: Adventures in the Animal Kingdom and Two Girls and a Mouse Tale. Riding the monorail over to the Polynesian Resort for some lunch at Captain Cook’s. When you’re spending the afternoon Disney Resort Hopping around the Seven Seas Lagoon seeing Disney’s Grand Floridian Resort, Disney’s Polynesian Resort, and Disney’s Contemporary Resort, there is no easier way to get around than riding on the monorail. 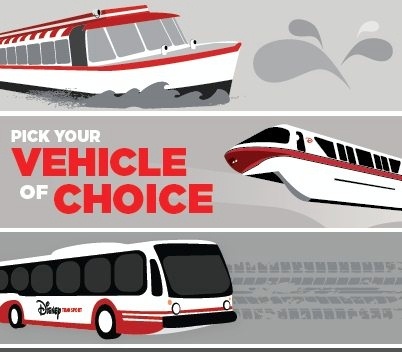 The Disney Monorail allows guests to travel throughout Walt Disney World for free! The Magic Kingdom, Epcot and select Disney Deluxe Resort Hotels are just minutes away by monorail. The Walt Disney World Monorail System has 2 separate lines that travel throughout Walt Disney World Resort. The Epcot Express Monorail originates at the TTC and offer express, non-stop, round-trip service between Epcot and the Magic Kingdom dropping guests off for easy entrance onto both parks with minimal wait lines. The Walt Disney World Monorail System operates from one hour prior to earliest park opening until one hour after latest park closing. Insider Tips: Please note that no luggage or alcohol of any type is permitted on the monorail. All strollers must be folded and stowed out of the aisle. Medical strollers for Guests with disabilities will be treated as wheelchairs. We do like riding the monorails at WDW! Christian loves riding on the monorail most of all. At Disneyland, you can ride in the front cab, but you can’t at Disney World. Having fun at the 2019 International Flower and Garden Festival. 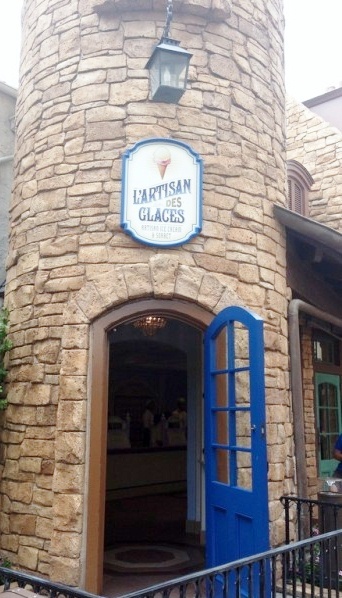 One of our favorite sweet spots at Epcot is the L’Artisan des Glaces (The Artisan of Ice Cream) in the France pavilion. It’s been very warm at Disney World this week, sunny and in the high 80s. When Christian was at Epcot last weekend checking out the 2019 International Flower and Garden Festival, he decided to take an ice cream break. The ice cream there is as good as Ben & Jerry’s! 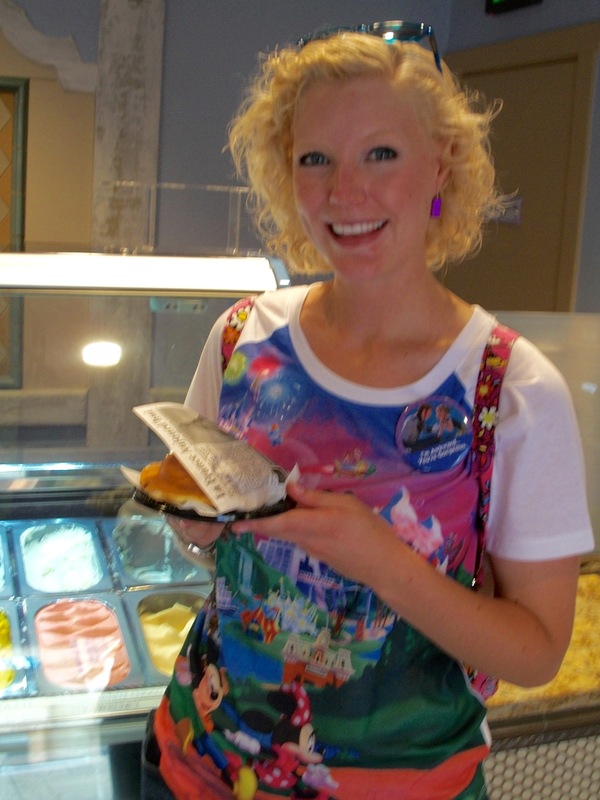 This is also where you can buy Caroline’s favorite ice cream sandwich: The Croque Glacé! The cast member making her masterpiece. There’s an entire table of rows and rows of stacked brioche buns. 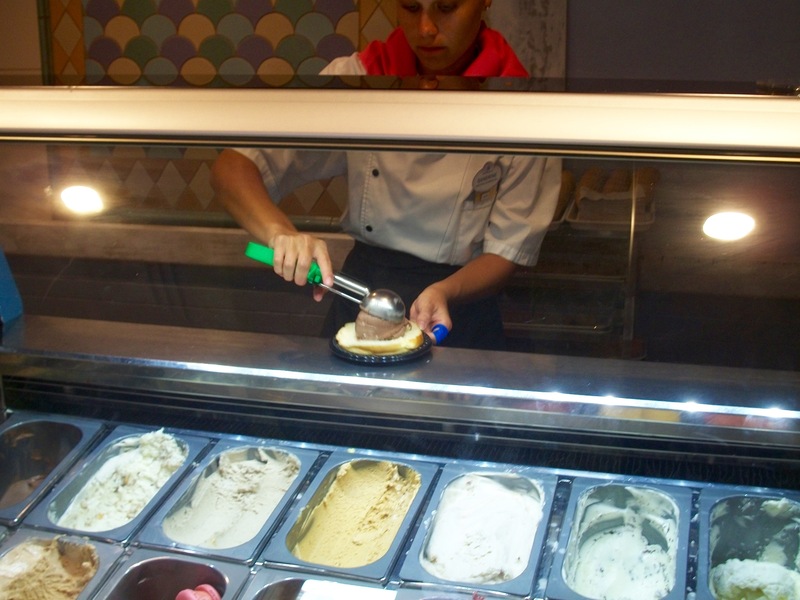 You pick your ice cream flavor, then a topping sauce (chocolate, caramel, or raspberry). Adding ice cream to her Croque Glacé. 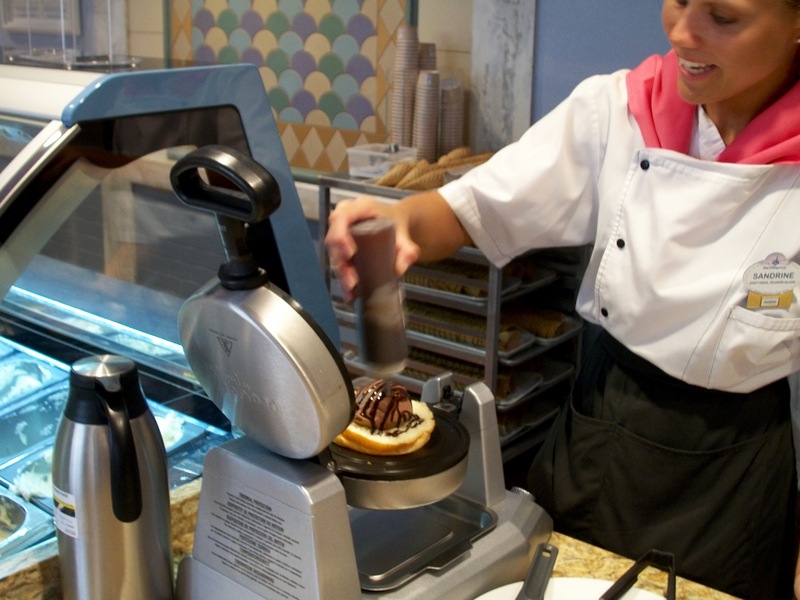 Huge Brioche bun – check!, chocolate ice cream – check!, sauce – check!, hot waffle grill – check! 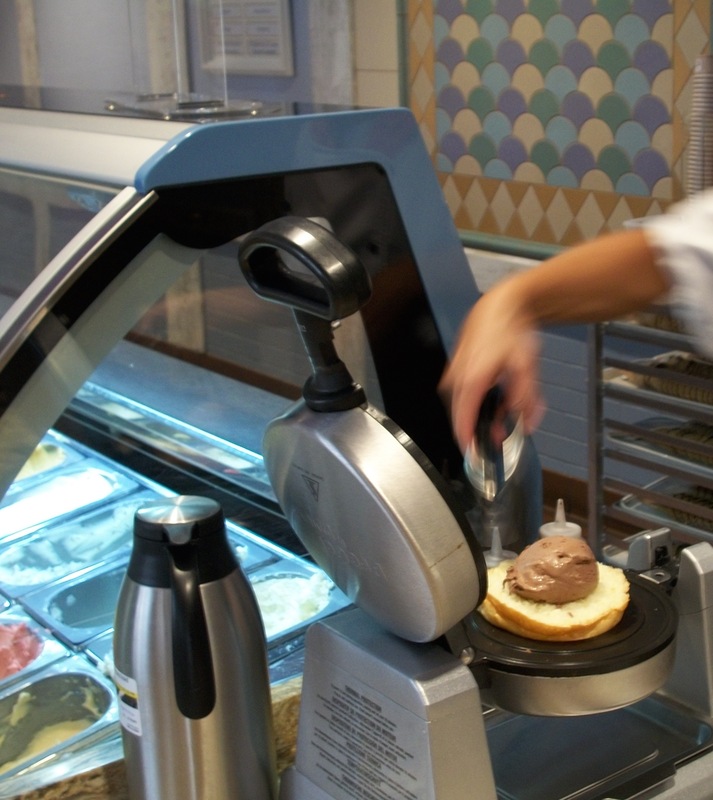 At the end of the ice cream counter is what looks like a Belgium waffle maker. Next, some chocolate sauce drizzled on top! Time to close the lid. Then, voilà! 30 seconds later, it’s warm and ready to eat. 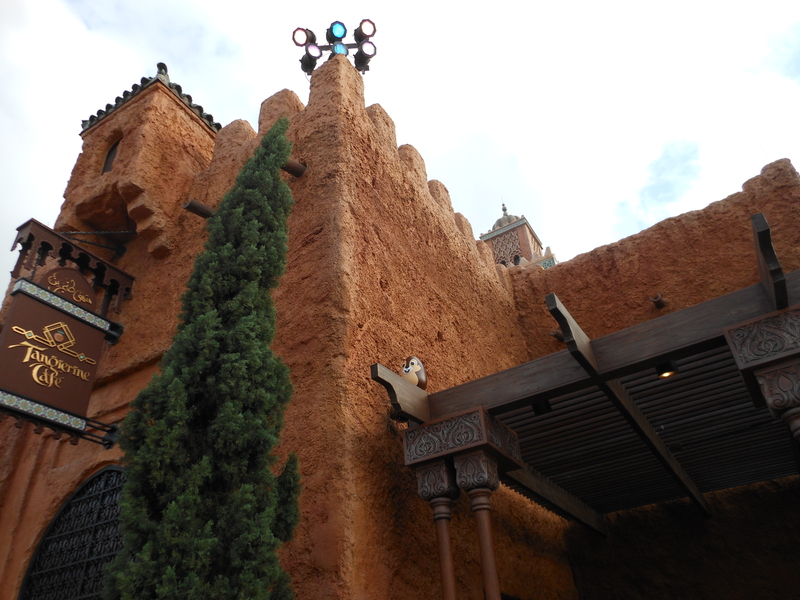 The France Pavilion at Epcot. The Creperie’s location will be on the left. 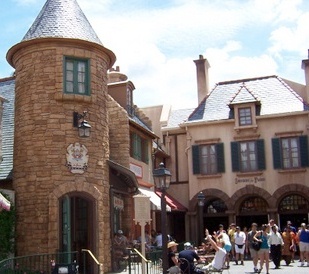 A brand new crepe restaurant is planned near the Remy’s Ratatouille Adventure ride now under construction now at Epcot France. It should open next year. 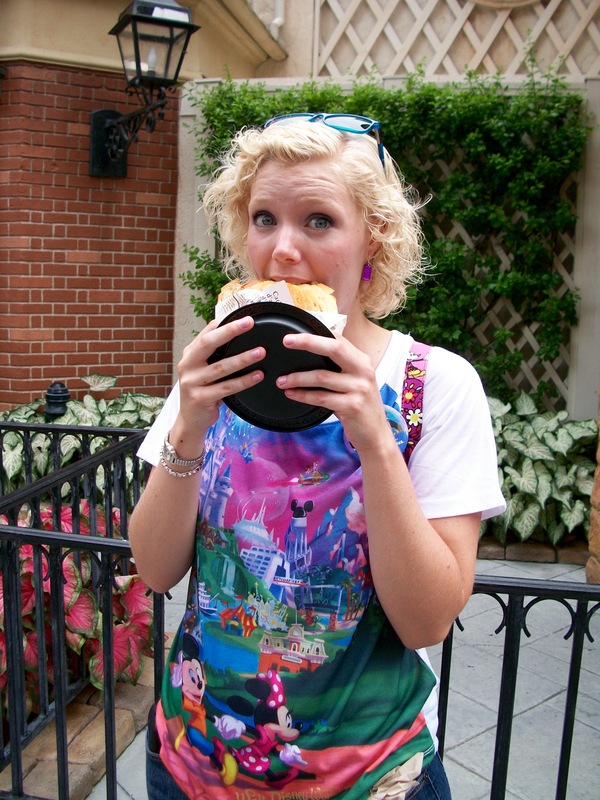 The Creperie at Epcot France. The Creperie’s menu will have table service and quick-service options, with a menu inspired by the Brittany region of France. Chef Jerome Bocuse — the man behind the theme park’s Chefs de France and Monsieur Paul eateries — is planning the delicious cuisine for the crepe-driven spot. We love crepes, especially the dessert ones with bananas and chocolate syrup! 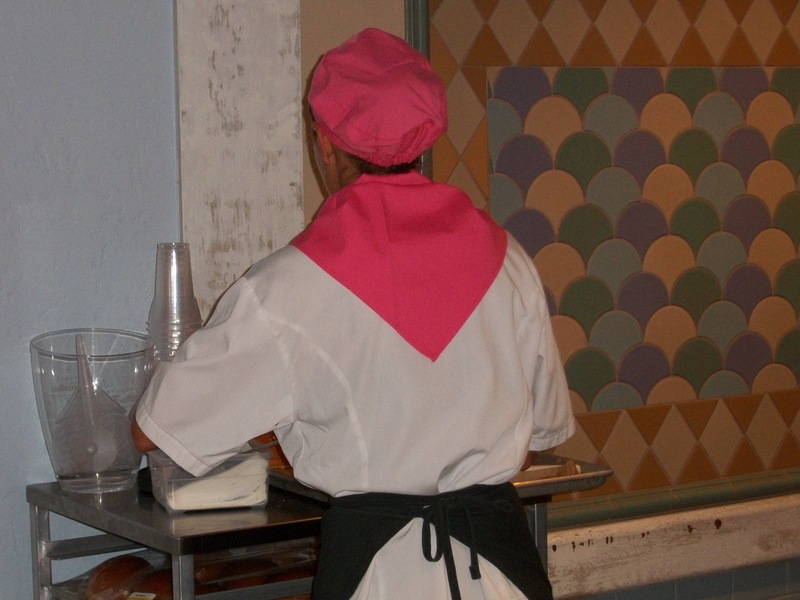 We are looking forward to this Epcot update the most! The new Ratatouille ride will be trackless. March 13, 2019 Update: The Orange Bird sipper has sold out just one week after the 2019 International Flower and Garden Festival opened! Disney has ordered more but it will take 3 weeks to restock them! We are so disappointed. We planned on having our brother buy 2 for us this weekend on his day off! Disney only ordered 45,000 Orange Bird sippers for the 90 day Festival that runs into June this year. That’s 500/day. Right now, they’re selling 3x that many a day. They will run out before the Festival ends on June 3, 2019. So, if you want one, get it quick before they’re all gone! Check out those ebay prices!! !